Screening people in, not screening people out. This is the goal of the new Minimum Qualifications: Best Practices in Recruitment and Selection document produced by Multnomah County, Oregon. The document is one component of a larger plan to advance racial equity through examining and transforming hiring practices within the County. Analysis of hiring process statistics is part of the Multnomah County Human Resources’s Strategic Plan, under the leadership of Director Travis Graves. An analysis of all County applications for a six-month period revealed that a significant percentage of applicants were not making it past the minimum qualifications step. 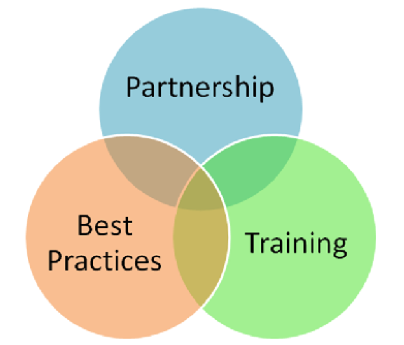 Creation of the Best Practices document involved reviewing current practices as they relate to minimum qualifications, making recommendations and adjusting processes, and then institutionalizing changes by creating resource tools for implementation. Minimum qualifications often serve to reduce a pool of applicants to a manageable number. Multnomah County is working to ensure that its minimum qualifications only disqualify those who could not perform the job for clear and concrete reasons, rather than posing artificial barriers that could allow potential employees to fall through the cracks. Does a candidate really need five years of experience and a PhD to perform the tasks? Is a year of related experience really necessary when a position will include on-the-job training? Why not treat part-time experience on par with full-time? How can we separate the former incumbent’s qualifications, which were accrued over time, from necessary qualifications for the position at entry? These are the kinds of questions beginning to be asked in Multnomah. The County formed a project team on this issue in May of last year. The team included hiring managers, recruiters, human resources staff, and others who played a role in identifying and conveying minimum qualifications. Human Resources Project Manager Amy Lippay stated this project was a first for Multnomah County as the team combined a project management approach with regular use of the County’s Equity and Empowerment Lens with a racial justice focus. The Lens encourages examination of issues and decisions in relation to the “5 P’s”: People, Place, Process, Power and Purpose. The 5 P’s allow for consideration of potential impacts that may not ordinarily be prioritized. The project team began by documenting the state of minimum qualifications policies and procedures for its different departments. 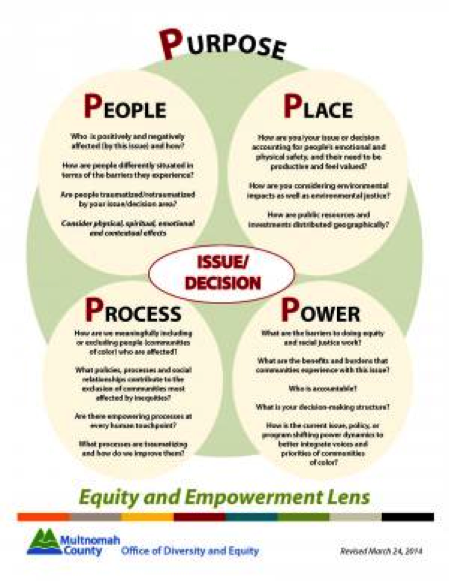 Kory Murphy, the Equity and Empowerment Lens consultant attached to this project, designed a set of questions influenced by the 5 P’s. These questions helped employees throughout Multnomah County begin to think about who may be advantaged and disadvantaged by current minimum qualifications practices. The questions were sent in a survey and several open discussions were held with employees throughout the organization. One of the prominent themes coming out of these discussions was that current minimum qualifications tended to favor dominant identities by emphasizing the need for formal education and previous government experience. Disproportionately, women and people of color have a more difficult time meeting these qualifications because of systemic barriers. Kory’s five questions and utilization of the Equity and Empowerment Lens challenged staff to think about who might be privileged and who might be left out by status-quo processes. The Best Practices document was developed from the input of numerous stakeholders. The document is now being used as a tool for staff involved in hiring decisions throughout the County. Human Resources put together a two hour retraining on minimum qualifications that all recruiters completed in March. Hiring managers are currently being trained on the new guidelines through a brief eLearning and consultation with their respective recruiters as they embark on a new search process. The document clearly states that the new minimum qualifications guidelines were created in order to foster a more equitable workforce. The content begins with a description of hiring manager and recruiter roles as related to minimum qualifications. Then, the document outlines several best practices to use, including ensuring minimum qualifications relate to essential functions of job performance, conducting a job analysis to determine key tasks and competencies required for job performance at entry, considering potential in applicants in addition to their current skill sets, and taking measures to ensure that minimum qualifications are accurate. Then, the document outlines how to effectively convey the chosen minimum qualifications in job announcements. The document stresses constant communication between the hiring manager and recruiter. Guidelines also recommend erring on the side of passing candidates through the minimum qualifications step and looking for alternative ways to qualify candidates such as transferable skills or unpaid experience. These changes represent a major shift for the County, according to Amy. Previously, hiring staff and recruiters felt bound to the minimum qualifications referenced on job classifications, but classifications are now being re-framed as guidelines. Strong emphasis is now placed on hiring managers and recruiters having in-depth conversation and critical thought about the minimum qualifications needed to perform a job successfully at entry, taking care to consider all the possible ways of qualifying. Kory states that institutionalizing these conversations creates a structure that promotes equity. Amy and Kory believe that changes in the minimum qualifications policies and procedures will open doors for people traditionally excluded from County positions. They also believe that a more diverse workforce will be a more effective workforce. Data disaggregated by age, race, ethnicity and gender will be collected throughout the hiring process to see whether the new guidelines are having the desired effect. Amy stated it was critically important to really take time to pause and deeply examine processes. “It was worth slowing things down to gather different perspectives and let that information sink in,” Amy said, reflecting on how using the Equity and Empowerment Lens influenced the team to make room for discovery. Without giving space to new ways of thinking about minimum qualifications, they may not have realized where or how there was room for improvement.